Hello again readers and welcome back! Today's blog post is going to cover some of the interesting things I found poking around MacOS while developing updates to the Live Response Collection. 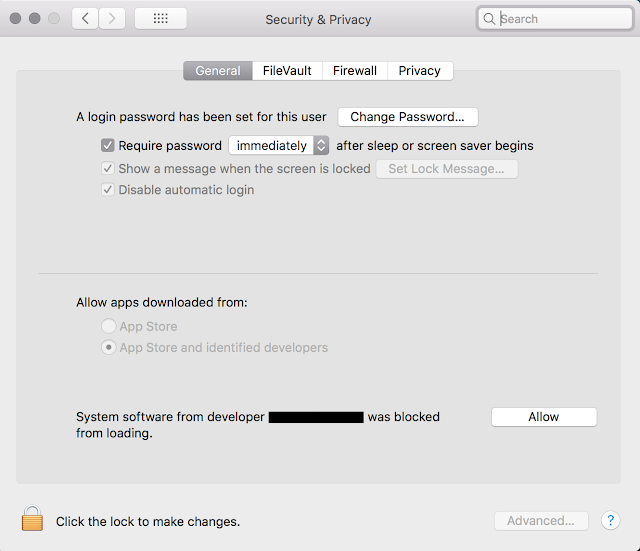 First off, I have to offer my thanks to Sarah Edwards for taking the time to talk about what she has done with regards to the quirkiness ("official technical term") regarding MacOS, System Integrity Protection ("SIP"), kernel extensions, and everything else that completely derailed my plans for pulling data from a Mac! Our story begins by trying to diagnose some errors that I noticed while trying to perform a memory dump on my system using osxpmem. 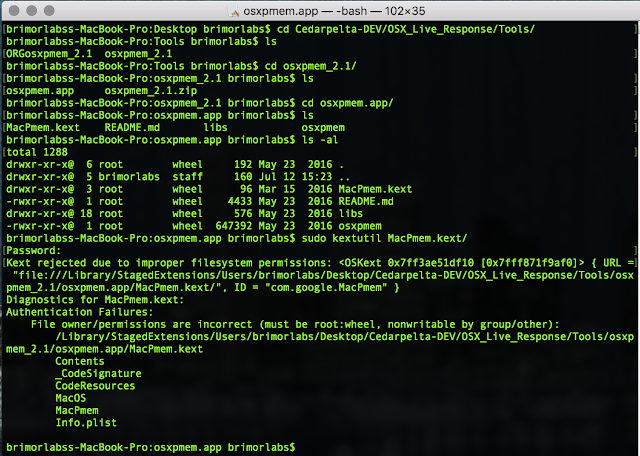 The errors were related to my system loading the kernel extension MacPmem.kext, which resulted in the error message "/Users/brimorlabs/Desktop/Cedarpelta-DEV/OSX_Live_Response/Tools/osxpmem_2.1/temp/osxpmem.app/MacPmem.kext failed to load - (libkern/kext) system policy prevents loading; check the system/kernel logs for errors or try kextutil(8).". Even though I was running the script as root, for some reason the kext was failing to load. The Live Response Collection script has always changed the owner of the kernel extension, so I knew that ownership was also not the problem, so that left me in a bit of a bind. Fortunately the tool "kextutil" is included on a standard Mac load, so I hoped that running that command could shed some light on my issues. The results from running kextutil were mostly underwhelming, with the exception of .... what the heck is that path? Output from kextutil. 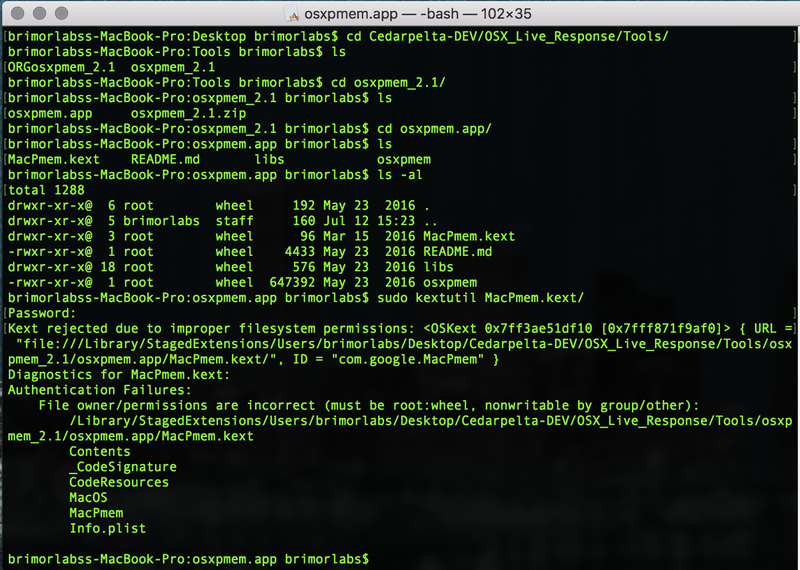 What is "/Library/StagedExtensions/Users/brimorlabs/Desktop/Cedarpelta-DEV/OSX_Live_Response/Tools/osxpmem_2.1/osxpmem.app/MacPmem.kext" and why are you there, and not the folder you are supposed to be in? ... then, if you navigate to "Security & Privacy" and click on the "General" tab, and clicked "Allow"
It would (ok, *should*) then stop the symbolic linking (that is what I assume is happening, although that is not confirmed yet) from the original folder to the StagedExtension folder to allow the sandboxing/SIP to occur. That means that the kernel extension would then be able to run, and the world would be a glorious place. Except.....it seems that once a developer/company signs their kext, which allows the bypassing of SIP, that means that EVERYTHING signed by them in the future will also, automatically, be trusted. Obviously this could present a security issue down the road if those signing certificates would be stolen. I don't know of that happening yet, but it does seem like it is plausible and could presumably happen in the future. I've tried a couple of workarounds to bypass the SIP process to allow me to dump memory from a system without having to go through all of the bypass sip/csrutil steps (if you are unfamiliar with that, please follow the link here). None of my attempts succeeded yet, but I am still trying. I specifically do NOT want to reboot the computer, because I want to collect memory from the system and not potentially lose volatile data. I will either update this post, or continue this as a series, when I find a sufficient work around (if there is one) to this issue! With that being said, if you found a way to dump memory from a MacOS live system that has SIP enabled, and if you are able to share it publicly (or privately) please share your methodology. I would love for the next LRC update to be able to include memory dumps from systems with SIP enabled!